My nephew was running a high temperature all through the night yesterday. The only concern that boy’s mother had the entire night was – ‘I hope it isn’t swine flu’. Isn’t this a natural sentiment these days? Swine flu is growing like a wildfire and has claimed 624 lives across the country in the last 45 days. It is India’s Ebola, at the moment. About 9,311 people have contracted swine flu in 2015 with Gujarat, Rajasthan, Telangana, Maharashtra and Madhya Pradesh being the high on toll. The Aligarh Muslim University in Uttar Pradesh has suspended classes after a student died on campus. Such is the dread! Do we know why the monster H1N1 has resurfaced in our country? It’s primarily because we are not very hygiene friendly. The primary portals of entry for the H1N1 virus are the nostrils and mouth/throat. With the kind of dwellings and low sanitation most of our population lives with, it’s difficult to avoid coming into contact with H1N1. However contact with H1N1 is not so much of a problem as its proliferation is. Although initial symptoms seem like Cold & Flu, they are far worse. Some of the most prominent Swine Flu symptoms are: extremely high temperatures, body breaking aches and in some cases diarrhoea and nausea are also reported. Although early detection and right care ensure medication/recovery, it can easily be a threat too. It is only wise to adopt Swine flu prevention. Prevention in this case is certainly better than cure, lets understand how little it takes to prevent from getting infected. 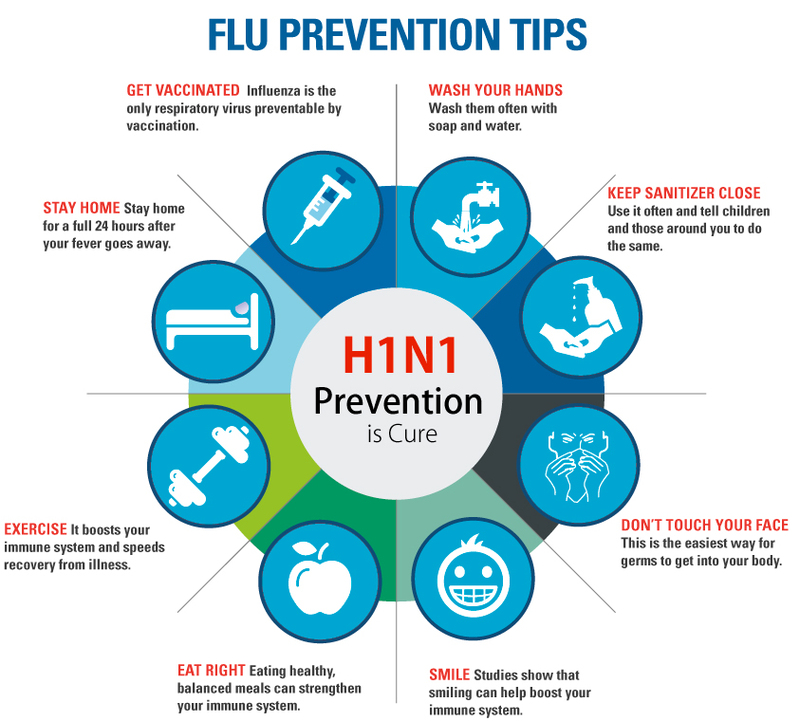 Here are some very simple steps, that can be practiced to safeguard ourselves against the deadly H1N1. 2. No Touch: Stick to ‘Keep-the-hands-off-your-face’ regimen. Resist all temptations to touch any part of face, unless you are willing to go wash hands right away. 3. Gurgle a Gargle: Gargle twice a day with warm salt water. Lets not underestimate this simple, inexpensive and powerful preventative method ! H1N1 takes 2-3 days after initial infection in the throat/ nasal cavity to breed and show characteristic symptoms. Simple gargling prevents further breeding. To present a comparison, gargling with salt water has the same effect on a healthy individual that Tamiflu has on an infected one. 4. Clean Your Nose: To supplement the above, incase you happen to contract the virus, you can also eliminate it by cleaning your nostrils every day with warm salt water. Blowing the nose hard once a day and swabbing both nostrils with cotton buds dipped in warm salt water is very effective in bringing down viral breeding. 5. Have Lots of Vitamin C: Boost your body’s immunity with foods that are rich in Vitamin C (Amla and other citrus fruits etc). in case you choose supplements, i.e intake of Vitamin C tablets, ensure that it also has Zinc to boost absorption. 6. Be Adequately Hydrated: Drink as much of warm liquids (soups, tea, coffee, etc) as you can. Having warm beverages has pretty much the same effect as gargling. They wash off breeding viruses from the throat into the stomach - where they cannot survive, breed or do any harm. Is it not in our hands to wash off H1N1 ? Lets adopt these small lifestyle changes to stay safe. There are some preventive flu shots that are easily available now. However, incase you feel the need for any further information, ask a doctor directly at Lybrate – its for free!